Huronia Chapter - Ontario Archaeological Society: How many sites might we be looking at? 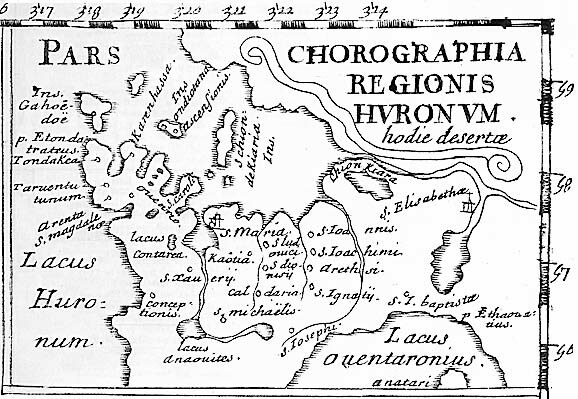 If we are to define Ahrendarrhonon territory as being contained within an area bounded on the east by Lakes Simcoe and Couchiching, in the west by the Coldwater River Valley, to the north by the Trent Severn Waterway and in the south by a line drawn from Hawkstone to Bass Lake then we must examine most of the sites contained within the current municipalities of the City of Orillia, Severn twp and Oro – Medonte twp. Based on the data that I am aware of this portion of Huronia contains about 260 archaeological sites. Even thinking about examining the data available from 260 archaeological sites is more than somewhat daunting. Attempting to sift through this data in an effort to isolate one particular site or even come up with a reasonable list of candidates for the 1610 wintering camp of Iroquet and his people seems almost impossible when we look at this number alone. We need to break this number down. Let’s first define an archaeological site. An archaeological site may include anything from a fully excavated native village complex like the Ball site to a single find spot of perhaps one arrowhead that was found beside a trail. By looking at the current data available we can set aside a number of sites that show insufficient data to be what we are looking for by way of a winter camp or village site. Next we might more closely define our search area. While in my first definition I have been quite broad and included all sites within each of the three municipalities mentioned, it is clear that not all the sites within each municipalities need be included. I would propose that any sites west of Hwy 400 would be out of our search area and that we redefine that western boundary to be in line with Hwy 93 at Barrie north to its intersection with Hwy 400 followed through to its crossing of Matchedash Bay at Waubaushene. This reduction in territory would reduce the number of sites that we need to look at in Oro – Medonte while still being generous enough to included all the sites speculated to be Ahrendarrhonon. The most defining parameter in our search for the Iroquet/Brule site of 1610 is that of dating. Within our searchable sites are some that are archaic or prehistoric with no signs of European contact and others that may clearly date to the historic period with no sign of protohistoric or early historic occupation. Once these sites are identified as best we can by date we need to find two sites that correspond in dating and are close enough together to show simultaneous occupation within the principle village’s territory. From the historical record it would appear that the Ahrendarrhonon only occupied a maximum of four villages at any on time and their Nation’s territory was the first to fall to the attacks of the enemy. Once mapped, it may well become apparent that we will see four clusters of village sites with staggered dating. It will be within one of these clusters that we will find what we are looking for. It is precisely this approach that will define the Huron villages that are prehistoric although the problem here may well be that everything is/contains historic trade goods. as contact has to be about 1535. But there is no question that the fur trade is given to start with Amyar de Chaste- and his court followers. The failure of the Muscovoy Company really openned up the fur trade beetween 1585 and 1600. So the question is would the Cord obtain significant volumes of trade goods to actually show archaeologically in their new villages in Huronia .Or would it be second generation villages that show trade goods in appreciable quantities.? Dean thinks Ball is 1590-1605- definitely a pre Cahiague village and it has lots of trade goods-.Bill Fitzgerald thinks Ball is Cahiague.Of course we really need good time markers to differentiate village sites.You can see the complexity of this with Ellery/Bowman.Is it two villages or is it two clan areas. If we have 260 sites in the eastern area of Huronia and I agree that 2 principal villages and 2 satellites probably existed for at least 60 years we should only have 12 villages that are really Cord. So taking into account early villages,middle villages and late villages we should be able to reduce these into a pretty small series of datable villages.I would suggest one cluster exists in and around the Bass Lake area not unlike the Lalligan Lake area and another up in that big swamp where we were looking at last year..I suspect that the village at Van Slaven which is now in the City of Orillia is also associated with this village complex. After further review and refinement of what I see as the Ahrendarrhonon territory I have eliminated about 70 sites in Medonte twp that appear to be too far west or northwest of what I perceive to be a reasonable search area for these villages thus dropping our numbers to under 200 sites of interest.